By Martin Morse Wooster: Flying V Theatre is a Washington-based company that specializes in productions with sf-related themes. I’ve seen four or five of their productions, and they all have sf elements in them. What I remember is one about the Mario Bros. video game that was fun if weird and one about pirates that would have been a rollicking two-hour show except that it was three hours. I think they pride themselves on being Millennials but this Baby Boomer has enjoyed what they’ve done in the past. 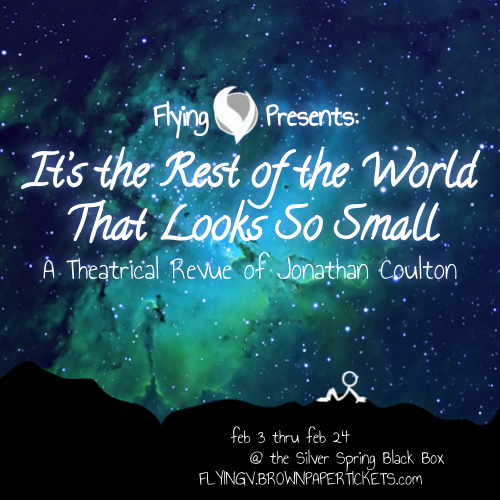 I haven’t heard from Flying V in a while, but they are now at the Black Box Theatre in Silver Spring, Maryland for the month of February, with “It’s The Rest Of The World That Looks So Small: A Theatrical Revue of Jonathan Coulton”, which was conceived and directed by Jason Schlafstein and Vaughn Irving, with music by Steve Przybyski and Jon Jon Johnson. You know about “theatrical revues,” those evenings where singers belt out 20 songs by Sondheim or Kander and Ebb? Well, Flying V’s production was like that—except it was for geeks! I confess I had not heard of Jonathan Coulton or “JoCo” until now. But I now know from his website http://www.jonathancoulton.com that he was born in 1970, was graduated from Yale in 1993, and was a member of the Whiffenpoofs (you know, like Cole Porter!). He worked in software until 2005 when he quit to become a full time songwriter/performer. In 2013 one of his songs was swiped by Glee and his battle with the TV show was dramatized on The Good Wife. Where he intersects with fandom is the annual JoCo Cruise, which is scheduled to be held later this month on a Royal Caribbean ship. A brochure on the cruise’s website for an earlier version promised customers “absolute dominion over an entire cruise ship filled with free food, fruity drinks, and swimming pools.” Who wouldn’t want that? They say they’re a cross between a music festival and a con, but what this reminds me of was the failed 1988 Worldcon bid for the cruise ship. They’ve held this cruise five times, and the guests this year whose names I recognize include N.K. Jemisin, Patrick Rothfuss, John Scalzi, John Hodgman, Mark Frauenfelder, and Wil Wheaton. Coulton says he writes “geek rock,” and he has geeky fans: one video I saw on YouTube had some heckler, after he said he was going to perform his last song, responded, “There’s always the null set!” Flying V performed his songs with an orchestra of four and a cast of about six, of whom four were on stage at any time. Songwriting is theatre for the mind, and mundane theatrical revues work because the music works for talented singers who don’t need stage tricks to convey the point of the song. What Flying V did was try to turn the songs into actual theatre. This was a mistake. For example, one of Coulton’s more famous songs is “Code Monkey,” which is his tribute to his days coding. The song was not improved by having one actor wearing a rubber gorilla head while singing. “I’m Your Moon” is Charon’s consolation to Pluto after Pluto couldn’t be a planet any more. Having a cardboard moon confused the point of the song, which I didn’t fully get until I went to YouTube. “Skullcrusher Mountain” was not enhanced by having two singers in trench coats. As for the guy singing “Mr. Fancy Pants,” his pants were certainly fancy. Yes, they were. That’s all I’ll say. Jonathan Coulton is a talented guy. I’m sure I’d enjoy his concert, particularly with fruity drinks. I’m sure other people could sing his songs, just as I’m sure he sings works by other songwriters. I bet the JoCo Cruise is a lot of fun. But all the props and choreography drowned Coulton’s songs in treacle. Flying V should realize that the point of a theatrical revue is to showcase the songs. Minimalism should be the order of the day and the cast should work to show the audience how special the songs are. This means resisting the temptation to run up and down a two-story stage, and having far too many costume changes. And I’m sorry to spoil Flying V’s fun, but for this production they should have left their zap guns at home. I’m grateful to Flying V for introducing me to Jonathan Coulton’s songs, but It’s The Rest Of The World That Looks So Small doesn’t work. This entry was posted in Like Show Business and tagged Jonathan Coulton, Martin Morse Wooster by Mike Glyer. Bookmark the permalink.